Just a quick note to wish you all a great Christmas and New Year. 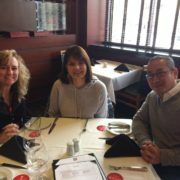 The Kansas City staff of Connect 5000 enjoyed Christmas lunch at Fogo de Chao on the Plaza. Talk to you in January! http://www.connect5000.com/wp-content/uploads/2017/12/IMG_1246-1.jpg 2448 3264 Ray Ruecker http://www.connect5000.com/wp-content/uploads/2016/07/connect5000.png Ray Ruecker2017-12-22 20:32:512017-12-22 20:32:51Merry Christmas and Happy New Year! This year has flown by quickly. I haven’t blogged in a while so as the holidays descend upon us, I thought I’d share a quick tip. I’m an avid reader, with a Nook reader from Barnes and Noble with the Amazon Kindle app on the device. 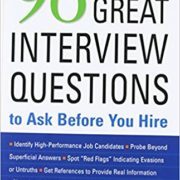 I recently finished Paul Falcone’s book “96 Great Interview Questions to Ask Before You Hire”. It had been on my reading list for quite some time and I always want to improve my hiring skills. A while back, I chatted with a CEO by phone, then we had lunch in person and we chatted some more by phone a few weeks later. He mentioned that he made a couple of offers to some sales reps but the job candidates ended up getting counteroffers from their existing employer and decided to stay. Paul Falcone’s book addressed how to handle counteroffers in advance and not waiting till making a job offer to get blindsided by it. He had some good suggestions to get counteroffer opportunities out in the open early rather than be surprised later on. So as the CEO shared with me, I thought of the book. I told him about it and said I’d have it mailed to his office and to keep an eye out. Last Friday, I met with the CEO and 6 of his staff and he had the book in his hand showing everyone. Moral of the story: be alert to what your prospects are going through outside of what you’re trying to get them to agree to and add value. The book was less than $20, including shipping. I strongly recommend you read the book if you hire people regularly. In the meantime, I wish you a Merry Christmas / Happy Holidays and a great New Year! May you end 2017 well!